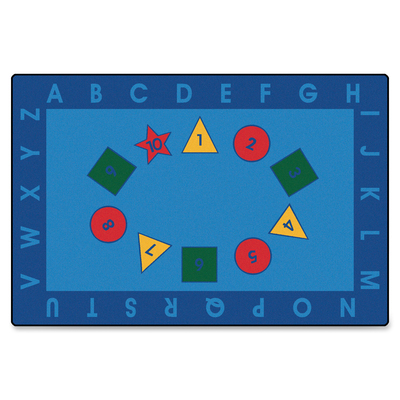 Rug With An Alphabet, Numbers And Shapes Theme Stimulates Children'S Imaginations With A Fun, Creative Design. Skid-Resistant Backing Prevents The Rug From Sliding During Use. Soil-Resistant Material Minimizes Stains And Provides An Easy Way To Clean The Rug. Rug Is Machine-Washable Using Cold Water And Mild Detergent..
Rug With An Alphabet, Numbers And Shapes Theme Stimulates Children'S Imaginations With A Fun, Creative Design. Skid-Resistant Backing Prevents The Rug From Sliding During Use. Soil-Resistant Material Minimizes Stains And Provides An Easy Way To Clean The Rug. Rug Is Machine-Washable Using Cold Water And Mild Detergent.